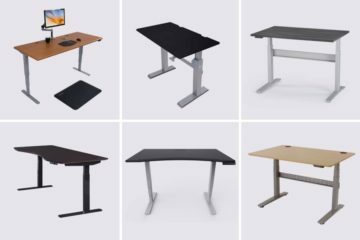 When we started reviewing standing desks, we quickly realized just how many brands there are, how many models, and how many features each of these desks have. 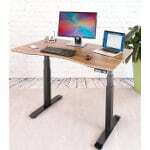 If you are looking to buy a standing desk, then you too may be having this problem. 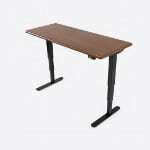 Fortunately, there are many places to turn when looking to buy a desk. Plenty of sites offer product reviews, a quick Google search will point you in the right direction, and many YouTube videos have in-depth breakdowns of the products. Our issue with this was the lack of wide-scale comparisons. Often a review will compare just 2 or 3 products, and you won’t have a clear idea of the different features of each. 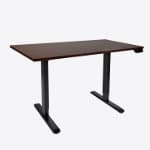 So, what we have done is found 57 different desks, from 21 different brands, and organized them into a large filterable chart so you can compare the features of each desk. Firstly, apologies if you are on mobile as this won’t be the most mobile-friendly chart. You can still use it of course, but there are many columns and rows and it is much easier to use on desktop. 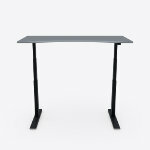 Our idea was to let you sort the table to help make your decision. 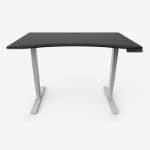 For example, if the price is important to you, you can order from lowest to highest price and then chose a desk from the cheaper options. 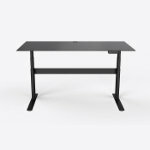 Maybe you aren’t bothered by price, but you want a desk that was made in the USA. You can search for that too. Or, if you are tall and need a big desk, just look for the desk with the highest adjustable height and you are good to go. 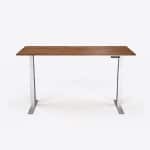 Below the table is a better explanation of each of the criteria we chose and how relevant it should be to you. Also, we explain some of the asterisks, N/A, and other cells in the table which may not be clear at first glance. Note: there are no affiliate links in this table or anywhere in this article. These links point either directly to the company website or to another article on Painless Movement. Other articles on Painless Movement may contain affiliate links. 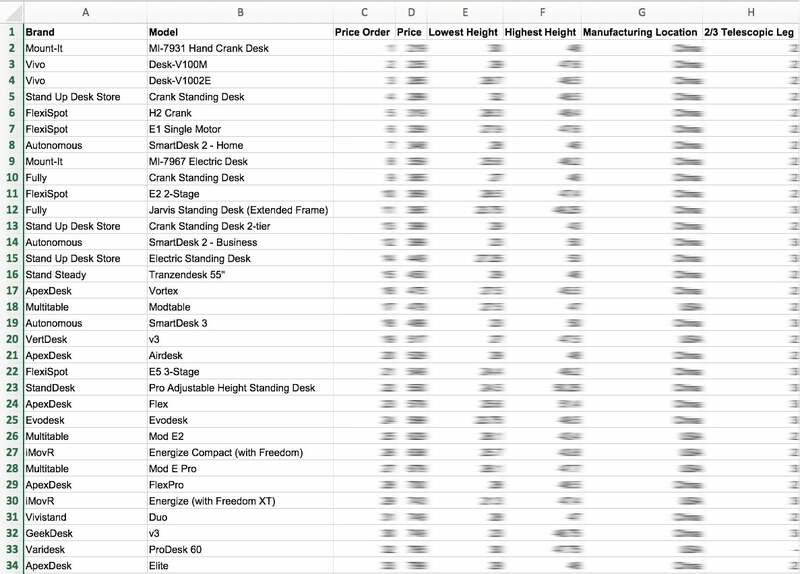 Given the size of this table, the amount of data, and the complexity of the product it is worthwhile having a small description of each of the criteria we chose to look at. 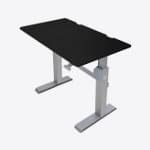 Due to some restrictions we have with displaying exact prices of the products on the website, we have used a scale to list the prices. 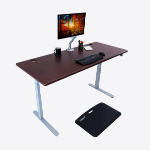 In this scale 1 is the cheapest standing desk, and 57 is the most expensive. 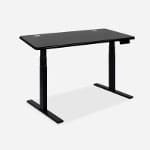 We have used the price of the desk at its bare minimum with no additional add-ons – so given that some desks come with more features included than others the prices could change depending on your setup. 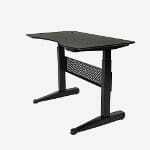 Many people will choose to add casters, grommets, cable management trays, keyboard trays and more, so the final price could be higher than expected. 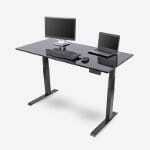 This range, however, will give you a basic indication of the value of the desk. This data point is self-explanatory. 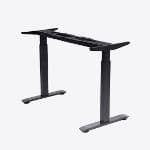 We have tried to provide the most accurate information, based on the desk frame height without a desktop. 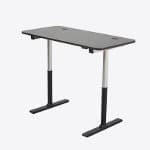 Some companies will display height information using a desktop, but given that desktop, width can vary it may not give you an accurate representation. 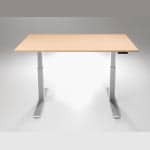 Lastly, some desks such as Fully and iMovR brand desks have optional height extenders. 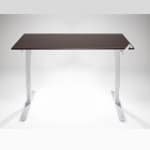 These have not been included in the table above but can be considered when looking a the maximum height of a desk. 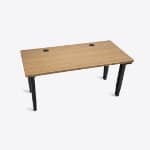 The manufacturing location is not always very evident, and many companies will often say “Made in the USA” when really they mean “Assembled in the USA”. 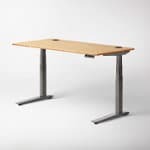 A desk is made from frame components, motor components, and other electronics, which often come from different locations – most commonly China, USA, and Europe. 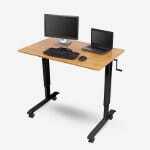 Adjustable height standing desks use a telescoping leg to change heights. 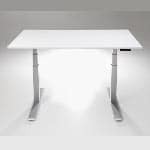 This leg is sometimes inverted, however, this won’t affect the performance it is just aesthetic. 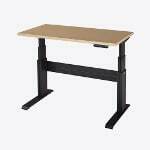 The desks either have a 2 or 3 level telescoping leg. 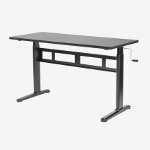 Generally, the taller desks will have 3, shorter desks will have 2. 3 level legs will, for the most part, be more stable at full extension and higher heights than a 2 level leg. 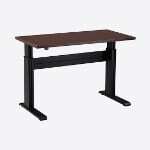 Depending on the brand, desks often come with an adjustable width. 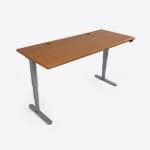 There are three main types of desk in this category. 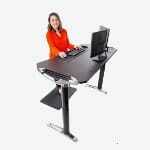 First are the desks that don’t adjust, such as the Varidesk. 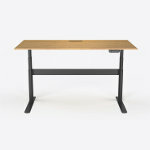 This desk is 60 inches wide and only comes in this one model. 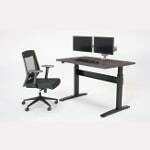 The other option is to buy the frame and desktop of a brand that has an adjustable width. 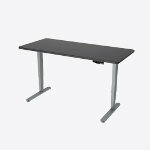 The manufacturer will mostly offer a few sizes, such as 40, 55, 60, 72 inches. 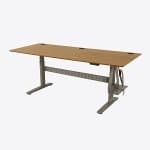 Lastly, if you have a very specific width of desk that you want, you can just buy the desk frame of one of the adjustable desk frames. 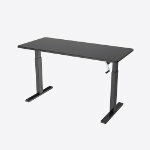 Many of them support widths of 30 – 80 inches, so you can use your own desktop to create a desk of the exact width you need. 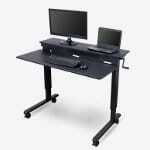 Again, with depth most brands offer a standard 30-inch depth, with some offering 24-inch shallow desktops too. If you want to be more precise, you can use your own desktop on top of the frame. 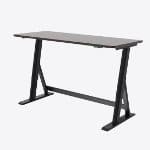 The number of legs of a desk affects the weight, weight capacity, and stability of the desk. 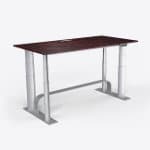 A four-legged desk is almost always going to be stronger and more stable than a 2 legged desk. 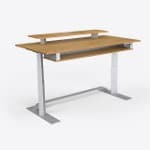 However there is also a correlation between number of legs and cost, so if you’re not willing to spend more money, then a 2 legged desk will generally be cheaper. 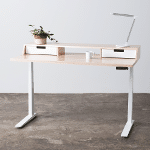 For 2 legged desks, the legs are either centered on the feet or offset slightly to the back. 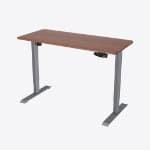 Some manufacturers claim that the desks with off-centered legs will have slightly more front-to-back stability since you often put your weight on the front of the desk. Many other manufacturers claim the feature is more aesthetic than anything else, and we tend to agree with this. 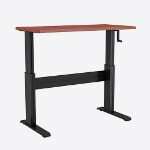 Generally, all standing desks have a crossbar directly beneath the desktop at the top of the frame. 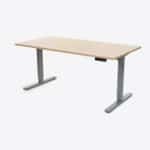 Many desks also have a secondary crossbar support halfway up the frame which is designed to help with side-to-side stability. 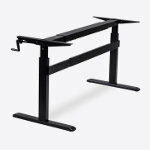 The benefits of this crossbar are of course the added stability, however, the part many people don’t like is that it can get in the way of your legs while seated (if you want to stretch them in front of you). 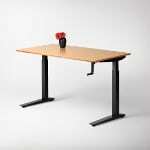 Many desks also forgo the crossbar and still have good stability. 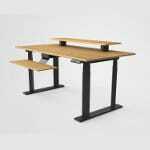 Casters are not a common standard feature on a standing desk, but most brands offer them as an add-on. 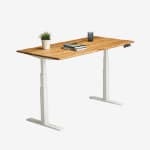 In this column, yes means that they come with the desk for free, no means the brand doesn’t offer the option, and add-on means that they are offered but at an additional cost. 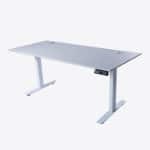 Weight capacity is measured in pounds and it is the recommended capacity by the manufacturer. 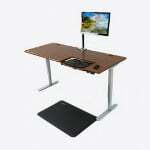 This includes the ability to still use the motor in the case of an electric desk. 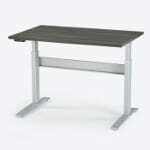 Adjustment speed between electric standing desk brands is highly contested. Generally, you are looking at between 1 – 1.5 inches per second, with some falling outside this range. 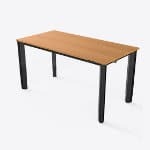 Obviously, for a manual desk, this is not applicable so the cell will be empty. Warranties vary quite greatly between brands. 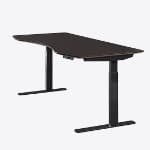 We have chosen to look primarily at the frame warranty, although in some cases the motor or electronics have a seperate warranty which we include in brackets. If there is no mention of motor or electronics, then it is the same as the frame warranty. 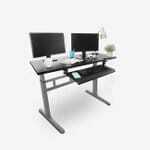 In general, an electric standing desk will come with either a standard up and down switch or a programmable console. In the case of a programmable console, there are often between 2 and 4 memory settings. 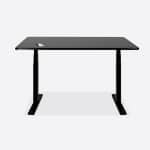 In this column, if the desk comes with a programmable console as the stock standard, then we have written the number of memory settings. 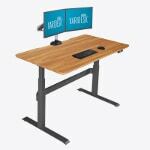 If the desk comes with a standard up and down console, but offers a programmable console as a paid add-on, then we have also included an asterisk. 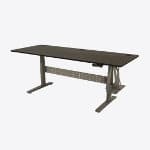 Most desks a single-tiered (just a flat surface), although come in two-tier models, or even as 3-tiered with monitor mount and keyboard tray add-ons. 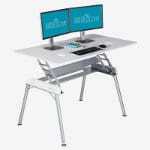 Some desks, such as the iMovR Lander, have a keyboard cutout for the tray, whereas desks like the Xdesk offer the keyboard tray as a separate add-on. If the number has an asterisk, once again this means that this is a paid add-on feature. This chart will be a “living” document that we will try to keep regularly updated, so please leave comments below with your thoughts and ideas. 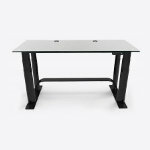 Additionally, if we have not included a product that you would like to see in the table, please let us know and we can add it in. 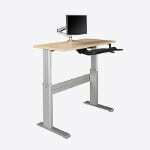 Lastly, we wish you all the best in finding a great standing desk!